What happens after we die? Is there such a thing as an unwilling martyr? Is the suffering of the flesh a skill set, something that transcends this world and could set one apart from humanity? 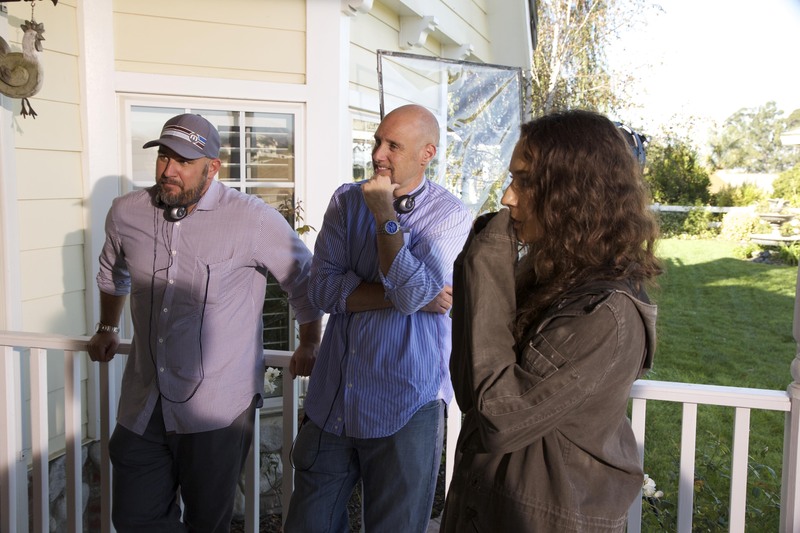 (L-R) Director Kevin Goetz, Director Michael Goetz and Troian Bellisario as Lucie in the action horror film MARTYRS an Anchor Bay Entertainment release. Photo courtesy of Anchor Bay Entertainment. How far would you be willing to go to find answers to life’s great mysteries? Would you kill? Would you torture? These are some of the questions that MARTYRS (Blumhouse Productions, The Safran Company, and Temple Hill Entertainment) asks – and wants you to ask yourself. But before you can begin to answer, there are other questions that should be considered. Did they need to remake the film in the first place? Were they able to add something to the conversation as opposed to just asking it again in English? The question of what purpose a remake serves is not an easy one to answer. Remakes are a lot like cover songs; they’re done out of love. But are you making it your own or is it simply a copy? In making a remake, the choices shrink, thus making those small decisions magnified and more important. Do you “re-interpret” the melody, structure, etc; do you change the style completely and turn a punk song country? Or do you do your damnedest to be faithful to the original, an homage, a tribute of devotion? (L-R) Ever Prishkulnik as young Lucie and Elyse Cole as young Anna in the action horror film MARTYRS an Anchor Bay Entertainment release. Photo courtesy of Anchor Bay Entertainment. If you change nothing, you risk having fans of the original decry that the decision to remake it was pointless. If you change everything, fans of the original will say it doesn’t remain “true” enough to the source material. It’s a no-win situation. The only solution is perhaps to ignore what anyone who has seen the original would want/think – an impossibility of course as one would have to assume that the principle decision makers would all have seen the original before signing off on a remake, and they would certainly have their own opinions on what should be done. Does MARTYRS go the route of re-interpretation or cover song, of inspired adaptation or architectural blueprint, of victim or martyr? Let me start by saying that in many ways I wish I had not seen the original French version first. I believe I would have enjoyed the American remake more and be less-inclined to judge it based on its decisions. Unfortunately, it is a remake, and as such, it has to be judged as a remake. How it compares and what choices it makes are ultimately what will determine much of its value and interest. It can never be a standalone experience in the grand scheme of things. (L-R) Troian Bellisario as Lucie and Bailey Noble as Anna in the action horror film MARTYRS an Anchor Bay Entertainment release. Photo courtesy of Anchor Bay Entertainment. And ultimately, MARTYRS is a slick production. The visuals and sound are strong. The directing (Kevin Goetz and Michael Goetz) is not poor – I may quibble with some of the decisions, like lighting such a dark story so brightly and presenting such grim and stained characters so cleanly, but overall, the scene to scene machinations are solid. The acting is fine, and when not delivering exposition-heavy dialogue or reacting too strongly to convey emotions that should have been better balanced by other factors (lighting, makeup, etc), when allowed to lose themselves in the story and characters, the actors (especially Troian Bellisario, Kate Burton, and Bailey Noble) are believable and help carry the weight of a difficult film. But back to my initial foray – what kind of remake is MARTYRS? A risky one. And a safe one. It accepts the challenge of walking the line between faithful homage, presenting the first half of the film in a not entirely shot-for-shot of the original but pretty close fashion (outside of some unnecessary additional exposition-driven dialogue, presumably to help less savvy American audience understand what is very literally and specifically going on). In the second half, there are many changes. And I would say many of them are successful – and even those that weren’t as successful are interesting. Bailey Noble as Anna in the action horror film MARTYRS an Anchor Bay Entertainment release. Photo courtesy of Anchor Bay Entertainment. Troian Bellisario as Lucie in the action horror film MARTYRS an Anchor Bay Entertainment release. Photo courtesy of Anchor Bay Entertainment. I don’t want to give too much away, but the largest non-plot related decision was to make the character of Ann (Bailey Noble) more passive. Throughout the movie, I thought this was a mistake, but the work that was done in conjunction with some of the larger changes, ultimately led to a satisfying ending for her character. Truth be told, I found myself wishing they had done more to be different. Given themselves more freedom to stray. The strongest moments were in the differences. In the scenes that paralleled the original, the film was unable to live up to the darkness and despair that inspired it, evoking but providing mere echoes of the greatest strength of the French version – the haunting, nearly visceral feel of the suffering. It is clear that this has been done intentionally, reducing the violence for a more mainstream audience. Fans of the original will no doubt hate them for this more polished and neutered vision. But, I feel that first time viewers will appreciate much of what has been done. It has a stronger thriller spine and provides a more American and Hollywood ‘happy’ ending. For the weekend, escapist moviegoer, this is a film that will in many ways be more satisfactory than the original. For purists, and for those that have seen the original, it will likely be difficult to accept. But if you can look beyond the scenes that are pale comparisons and ignore the moments that force explanation of theme and purpose, I think you’ll find enough to justify a remake. And that is no small achievement. So – does it survive? Do the sacrifices transcend? Does MARTYRS do what it must to provide answers? It’s difficult to say. This viewer found the remake to be more victim than martyr. It offers a glimpse, but I do not believe it truly sees beyond what was offered up in the original. As a result, unfortunately, there are just too many shortcomings for me to rate this as 4 stars. But I would remiss if I did not note that it is a very strong 3.